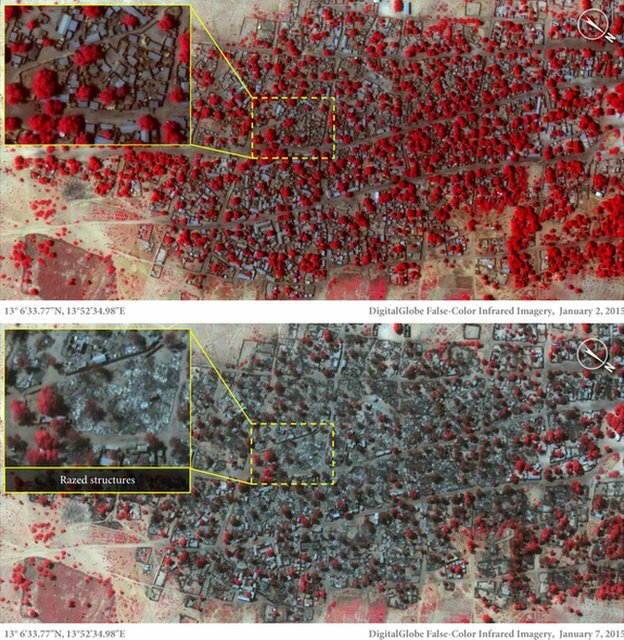 Satellite images of Nigerian towns attacked by Boko Haram show widespread destruction and suggest a high death toll, Amnesty International says. The images show some 3,700 structures damaged or destroyed in Baga and Doron Baga this month, Amnesty said. Nigeria’s government has disputed reports that as many as 2,000 were killed, putting the toll at just 150. Amnesty cited witnesses saying that militants had killed indiscriminately. It said the damage was “catastrophic”. There has been a surge in violence linked to Boko Haram. In the past week there have been several attacks, including by suspected child suicide bombers. Nigeria is to hold elections next month, amid growing doubts whether they can successfully go ahead in all parts of the country. Amnesty said the attack on Baga and Doron Baga, neighbouring towns in the far north-east of Nigeria, was the largest and deadliest Boko Haram assault that it had analysed. It said about 620 structures had been destroyed in Baga, and more than 3,100 in Doro Baga. The before and after satellite images were taken on 2 January and 7 January. “These detailed images show devastation of catastrophic proportions in two towns, one of which was almost wiped off the map in the space of four days,” Daniel Eyre, an Amnesty researcher, said in a statement. “It represents a deliberate attack on civilians whose homes, clinics and schools are now burnt out ruins,” he said. The BBC’s Will Ross says that while the images show the destructive nature of Boko Haram, they do not help establish just how many people were killed. Last week, Musa Alhaji Bukar, a senior government official in the area, said that fleeing residents told him that Baga, which had a population of about 10,000, was now “virtually non-existent”. “It has been burnt down,” he told the BBC Hausa service. Officials said militants had attacked Baga on 7 January, four days after overrunning a multinational military base in the town that had been abandoned by Nigerian troops. Amnesty’s Adotei Akwei told the BBC that although it was still difficult to access the area where the attack took place, the Nigerian government was “grossly understating” the death toll. One witness was quoted as saying that victims included small children and a woman in labour. Afterwards, militants drove into the surrounding country, rounding up women, children and the elderly, unnamed witnesses told the group. “Boko Haram took around 300 women and kept us in a school in Baga,” one woman, who Amnesty said had been held for four days, was quoted as saying. Posted on 15th January 2015 by newsafrica. This entry was posted in Africa, African Security, al Qaeda in Africa, Boko Haram, Nigeria, President Jonathan. Bookmark the permalink.